"Good Advice, Some Issues with Content Organization"
Good solid advice and insights into the world of meeting women during the daytime. Unfortunate tie between Magic Bullets that means its a pre-requisite to reading this, despite quite a bit of overlap of content between the two. If you use Love System, Mystery Method or Venusian Arts' dating systems this is a good bridge to applying them to meet women during the day. Daytime dating is all about meeting women during the day no matter the situation. 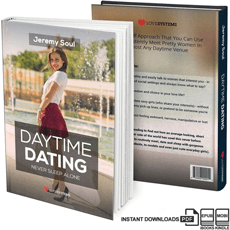 Jeremy Soul (the author of this book) and Paul Janka are the two most popular dating coaches who have focused on meeting women in the daytime and written books specifically on the subject. Daytime Dating takes you step by step through what is important to being successful at meeting women in the daytime and how to execute. In execution it starts with how to prepare before meeting a woman, then moves to how and where to meet her, and take you through the things you will need to do to successful escalate into dating her or escalating physically. The content is effective, and we've rated it an 8 on that dimension. Part of the reason for this is that it uses the Love Systems approach as explained in Magic Bullets as its foundation - already a good system. If you use a Love Systems style approach you'll feel right at home with this. There is some room for improvement however - that we'll get into later in this review. Some of the parts that make Daytime Dating stand out are how it explains what you need to do differently from meeting women at night. Your ability to hold and lead conversations for instance, is emphasized over some of the more 'fun focused' approaches most coaches recommend you use in bars and clubs. A lot of the content in Daytime Dating is very similar to the content of the Magic Bullets Handbook. In fact, you could say there is a lot of overlap. On the other hand, there are areas of Daytime Dating where you are told to refer to the Magic Bullets Handbook. For example where it comes to seduction, or escalating the relationship physically with a woman. And yet others where Daytime Dating brings you completely original content. This presents a bit of a conundrum to its readers. The end result is that you'll be able to make best use of Daytime Dating if you already very familiar with the Love Systems approach to dating and have already read the Magic Bullets Handbook. However, while reading Daytime Dating as a consequence you will find many of the chapters have similar content to Magic Bullets with some details on Daytime Pick Up integrated into them. Note: If you've already read Revelation has a lot of similarities in content to Magic Bullets, you will have a good enough understanding of the principles to not have to buy Magic Bullets in order to get the value from Daytime Dating. Personally, I feel that it would've made a lot more sense to just require people to read Magic Bullets before Daytime Dating, and have focused on creating only original content for Daytime Dating. What is Original that isn't in the Magic Bullets Handbook? Throughout this book Love Systems' dating system is applied to daytime dating scenarios with hints and details on how things work when meeting women during the daytime. The differences turned out to be a lot fewer than you would expect. So there is not a whole lot of value in this, unless you really are completely new to meeting women in the daytime and need it explained to you in detail. For anyone who has already been approaching and meeting women in the daytime you will not find any revelations here. All common sense. The original material, that adds to what you may have learned in magic bullets handbook, is found in some specific chapters and the bonuses. "Chapter 9 - Conversation mapping"
This was the most important addition. Jeremy Soul outlines an approach to preparing for conversations here that is definitely useful. When you meet women during the day your ability to make the best of the situation relies a lot more on your conversation ability than it does at night in the typical bar/ club situation. Your success depends on it. So this section was a necessary addition. I would've liked this section to be a lot bigger and see it go into a lot more detail in fact. When you first approach women during the day there are not that many different responses that women give you - it would've been great to see these listed and some good responses and conversational approaches to make the best of each response for example. So, there's an opportunity to take the reader by the hand and walk him through the conversations with more step by step tips and specific examples here. That would deliver tremendous value to men who haven't approached women during the day before. In many ways meeting women during the day is more scary than at night - because it is less common and socially acceptable. More detail in this chapter would help to eliminate that anxiety and fear - because the reader would have a much better understanding and expectation of how a woman is likely to react when he approaches. Approach anxiety is the term given to the fear of approaching a woman. This fear tends to be much greater when approaching women during the day, so this is a highly relevant bonus. I found this to be a good introduction into overcoming Approach Anxiety with an outline of several fairly good methods to tackle it. If you have read a lot of this type of material there is nothing that innovative however. If 'approach anxiety' is your sticking point, and you need something better, the best advice on the subject can be found in The Complete Game Seduction System by Chris Andersen. How to learn productively is a critical subject. Who wants to waste years learning this stuff? If you've been following Dating Skills Review for a while you'll know it is an area we really emphasize. It's good to see dating coaches putting more emphasis on it as with this guide. In it you'll find a lot of tips on how to learn faster - it's all good material. Some of it is inspired from Tim Ferriss' The 4 Hour Work Week if you are a fan of that. This book provides some good solid advice and insights into the world of meeting women during the daytime. It's a bit unfortunate that it is tied in to Magic Bullets in a way that means you should get that too, despite there being a lot of overlap of content between the two. If you use Love System, Mystery Method or Venusian Arts' dating systems this will be a decent bridge to learning how to use those systems to meet women during the day. If you want something more innovative to shake your system up more Paul Janka's Attraction Formula will be better for you. The "Daytime Dating - Never Sleep Alone," is a 3-part system that you can use to meet, attract, and date women. It is the first book by Jeremy Soul, one of Love Systems' authority on Day Game. This book covers years of dating experience, field-tested techniques, and comprehensive research. It takes men through the whole process of meeting and approaching women and closing the deal. It also explains what to do and say in various situations when approaching women. "Direct Daygame - Excellent Reading!" First of all, Jeremy Soul is a genius... His proposal is Direct Game in the daytime... But he is a member of Love Systems, which the main stuff - The Magic Bullets - advocates a structured indirect game (very similar to Mystery Method). How could he make it compatible with the Emotional Progression Model created by Savoy??? - He defends extensively the Direct Openers over the indirect ones in daytime, and he makes his point very solid. "Bait and Switch.. Don't waste your money. " Firstly, I seriously doubt that Soul is the "best daygamer " in the world. That would almost certainly be Yad, or Nick Krauser, on maybe Jabba. As for this book, advertised as, "Get this book, and you'll have everything you'll need for Daygame." Then after purchasing, you're told, if you want the real secrets of daygame not covered in this book, sign up for my Daygame Boot Camp for $3,000."